It is easy job to add select-option in ABAP Selection-Screen, but to add select-options in module pool or dialog program screen you can’t do it like you do in selection-screen. but in this article we will try to show you to add select-options in dialog program screen. 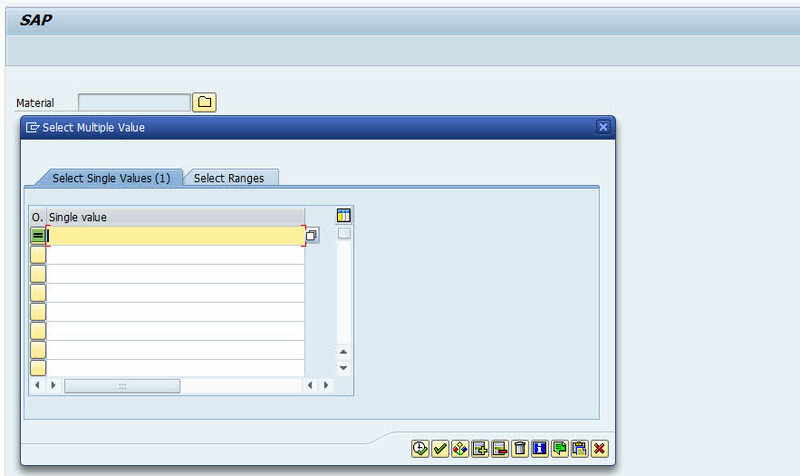 There are two method to add select-options in ABAP Dynpro screen. 1.Using Subscreen to add select-options in ABAP Dynpro screen. Create ABAP Program, and then write SELECTION-SCREEN to create SCREEN AS SUBSCREEN. This screen will be called by ABAP Module pool later. SELECTION-SCREEN BEGIN OF SCREEN 1010 AS SUBSCREEN. SELECT-OPTIONS: s_objid FOR dynp_rhpp-seark1. SELECTION-SCREEN END OF SCREEN 1010. Create ABAP Dynpro screen and Go to Layout screen then add Subscreen, input SUB1 as the name of subscreen component . In PBO and PAI write ABAP Code to call subscreen on selection-screen that you’ve write before. PROCESS BEFORE OUTPUT. MODULE status_1000. CALL SUBSCREEN sub1 INCLUDING sy-repid '1010'. PROCESS AFTER INPUT. MODULE exit AT EXIT-COMMAND. CALL SUBSCREEN sub1. CALL SUBSCREEN sub1 INCLUDING sy-repid '1010'. Then you will see the result like this picture. You can use COMPLEX_SELECTIONS_DIALOG to create select-options in ABAP Dynpro screen. First you need to create 2 separate field in ABAP Dynpro screen, one for low value and one for high value. For this sample we will create SELECT-OPTIONS with NO-INTERVAL. PROCESS BEFORE OUTPUT. MODULE status_0100. * PROCESS AFTER INPUT. * MODULE USER_COMMAND_0100. MODULE exit AT EXIT-COMMAND. MODULE user_command_0100. FIELD gv_matnr MODULE get_field ON INPUT. FIELD gv_matnr MODULE get_field ON INPUT. Create one field with the name GV_MATNR and one button with Function Code BTN1. MODULE user_command_0100 INPUT. CASE sy-ucomm. WHEN 'BTN1'. PERFORM fm_get_Range. ENDCASE. ENDMODULE. Create sub routine FM_GET_RANGE to run COMPLEX_SELECTION_DIALOG function module. FORM fm_get_range . * Dynamically holding Field name FIELD-SYMBOLS: <fst> TYPE STANDARD TABLE. IF gr_matnr IS INITIAL. gr_matnr-sign = 'I'. gr_matnr-option = 'EQ'. gr_matnr-low = gv_matnr. APPEND gr_matnr. CLEAR gr_matnr. ENDIF. ASSIGN gr_matnr TO <fst>. CALL FUNCTION 'COMPLEX_SELECTIONS_DIALOG' EXPORTING title = 'Select Multiple Value'(059) text = 'Finish Group'(058) signed = 'X' lower_case = ' ' no_interval_check = 'X' just_display = ' ' just_incl = 'X' search_Help = 'MAT1' TABLES range = <fst> EXCEPTIONS no_range_tab = 1 cancelled = 2 internal_error = 3 OTHERS = 4. IF sy-subrc = 0. READ TABLE gr_matnr INDEX 1. IF sy-subrc = 0. gv_matnr = gr_matnr-low. ENDIF. ENDIF. ENDFORM. FIELD-SYMBOLS: <fst> TYPE STANDARD TABLE. READ TABLE gr_matnr INDEX 1. In ABAP Program write this ABAP Code. REPORT ztest2. TABLES : mara. RANGES : gr_matnr FOR mara-matnr. DATA : gv_matnr TYPE matnr. DATA : BEGIN OF it_dynpfields OCCURS 3. INCLUDE STRUCTURE dynpread. DATA : END OF it_dynpfields. START-OF-SELECTION. CALL SCREEN 100. RANGES : gr_matnr FOR mara-matnr. DATA : gv_matnr TYPE matnr. DATA : BEGIN OF it_dynpfields OCCURS 3. DATA : END OF it_dynpfields. ABAP Code in Module GET_FIELD in PAI . MODULE get_field INPUT. REFRESH it_dynpfields. CLEAR it_dynpfields. MOVE 'GV_MATNR' TO it_dynpfields-fieldname. APPEND it_dynpfields. CLEAR it_dynpfields. CALL FUNCTION 'DYNP_VALUES_READ' EXPORTING dyname = sy-repid dynumb = sy-dynnr translate_to_upper = 'X' TABLES dynpfields = it_dynpfields EXCEPTIONS invalid_abapworkarea = 1 invalid_dynprofield = 2 invalid_dynproname = 3 invalid_dynpronummer = 4 invalid_request = 5 no_fielddescription = 6 invalid_parameter = 7 undefind_error = 8 double_conversion = 9 stepl_not_found = 10 OTHERS = 11. IF sy-subrc = 0. READ TABLE it_dynpfields WITH KEY fieldname = 'GV_MATNR'. IF sy-subrc = 0. gv_matnr = it_dynpfields-fieldvalue. ENDIF. ENDIF. PERFORM fm_get_range. ENDMODULE. READ TABLE it_dynpfields WITH KEY fieldname = 'GV_MATNR'. You can see the result like this picture below. which option can be selected in the active screen options tab?